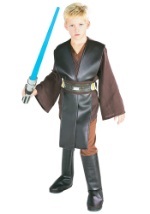 This Halloween, transform your newborn, infant, or toddler into a 900 year old Jedi Master with our baby Yoda costume. The adorable Yoda costume comes with a poly/flannel headpiece and robe. The hooded robe uses Velcro to shut in the front and has an attached mock shirt that zips up. The headpiece snaps together under the chin. Add dinosaur hands and feet and a toddler walking stick to add realistic accessories to this look.